As you know, I am a fan of the Rocky Mountain Barber Co. There a few reasons for that. First off, it’s a Canadian company which I can’t help but being partial too (being Canadian myself). Second and more importantly, they make good products. Having tried and used most of their products I have been converted. 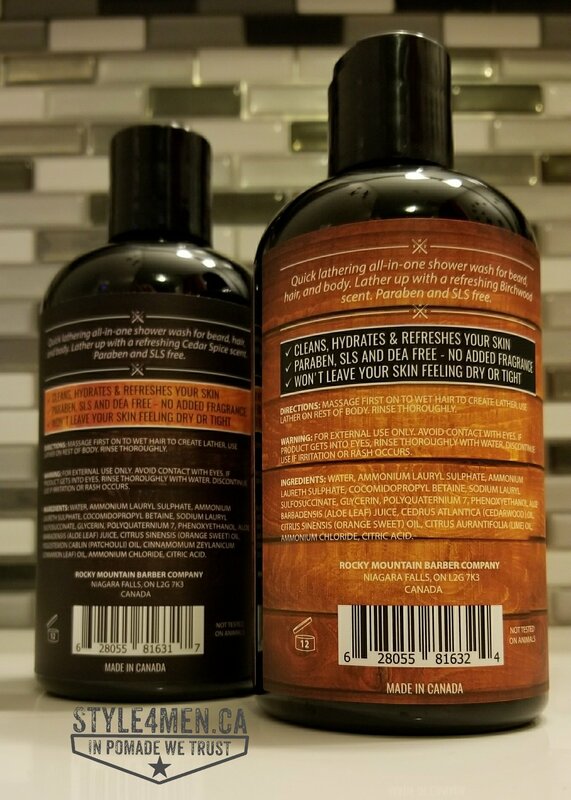 In this review I want to focus on the All-In-One Shower Wash. RMBC is of the opinion that having a product for your body, another for your beard and something else for your face is starting to be a lot in your shower stall. With that in mind they produced this “All-In-One” solution. From a practical point of view, I fully embrace this reasoning. How many darn bottles do I really need in there?! From an implementation perspective, I still have to be convinced. What is good for the body is not always so good for the face and concerning the beard I will have to abstain as I am shaver. I have previously tried their face wash and was thoroughly impressed. I ended up using the whole bottle. Trying out so many products for the Style4men.ca project, actually finishing a product is not something I often do and it should be taken as a good indicator. The face wash had a slight gel like texture while remaining a liquid. It did a great job of washing off the dirt while leaving enough moisturizing elements for my skin to not to feel dry. It also rinsed off extremely well. Something that is not always the case with face washes. My first test was using the “Birchwood”. Having been thoroughly impressed with the aromas of the sandalwood shaving products, I was expecting the fragrance to be similar in intensity. What I found was a smoother and more subtle scent. Something very tamed and far from being unpleasant. I enjoyed the aromas and was reminded of sweet orange with a woodsy element. The “Cedar spice” is perhaps a little more complex, where there is again a top note of sweet orange and middle note of wood, to finish things off the base note is an ever so slight pepper. That’s most likely the combination of cinnamon and patchouli. You might think that this is an odd composition and I might have initially agreed, but it works. While using this All-In-One wash I was pleased to find the bulk of what I enjoyed from the face wash. A product that does a great job of cleaning, rinses off nicely while leaving my skin feeling good. On the aspect of rinsing this product off, I find that it doesn’t leave a film or that I have to thoroughly rinse myself off to get rid of it. It’s a light product that is easy to work with. For anyone with allergies or skin ailments, first off I feel for you. Secondly and to the point, I had no reaction, redness or irritation using this product. I will venture that its high rinceability is in part responsible for that as you can easily remove all of it. The second part is the healthy choice of ingredients. At 237 ml, you are getting a decent amount of product that should last you well over a month if not 2. I found that squirting a dollar size portion in my shower sponge produced a generous amounts of suds. More than enough to do the job. Ingredients: Water, Ammonium Lauryl sulphate, Ammonium Laureth Sulphate, Cocomidopropyl Betaine, Sodium Lauryl Sulfosuccinate, Glycerin, Polyquaternium 7, Phenoxyethanol, Aloe Barbadensis (Aloe Leaf) Juice, Citrus Sinensis (Orange Sweet) oil, Pogostemon Cablin (Patchouli) oil, Cinnamomum Zeylanicum (Cinnamon Leaf) oil, Ammonium Chloride, Citric Acid. In closing, the labeling of this product is in line with the tough and rustic image of the brand, but the product you will find inside is nothing so rough. This all-in-one body wash is a very civilized option for your shower (or bath). 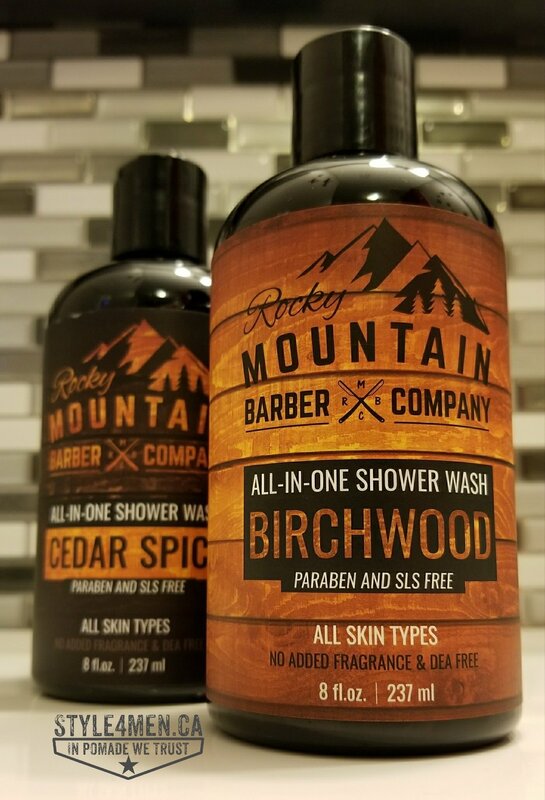 With life just getting more and more expensive, do yourself a favour and use the “STYLE4MEN” exclusive discount code and save a few bucks when shopping with Rocky Mountain Barber Co.